Do you struggle to achieve your 2-3 weekly servings of oily fish? Are you vegan or vegetarian? Want to improve your mobility and oil up those joints? Or do you just fancy trying something new? 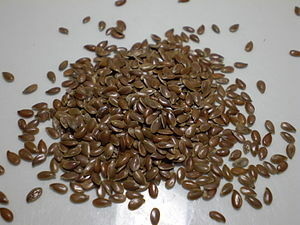 Linseed, or flaxseed as it is often known, is a seed from the flax plant that can be eaten whole, and as an oil, but is most easily digestible when ground down to milled form. It is an excellent source of both fibre and the essential fatty acid Omega 3. Omega 3 is an essential fatty acid that scientists believe helps to reduce the risk of developing heart disease. It is also recommended in pregnancy and while breastfeeding to help with the growth of the baby’s nervous system. It is most commonly found in oily fish such as salmon, mackerel, and fresh tuna. When we describe a nutrient as ‘essential’ we mean that the body cannot produce it itself and so it must be obtained from the diet. Many people find it easier to take supplements to achieve their Omega 3 requirements but taking fish oil supplements can put you at risk of developing liver damage because they contain high levels of vitamin A. This is where our linseed comes in! Each tablespoon of ground linseed/flaxseed contains almost 2g of Omega 3. How can I realistically get linseed into my diet? Stir into soups, stews, and sauces. And my favourite: coat your meat or fish with milled linseed to create a breadcrumb-style crust! Any more ideas or suggestions?? Mix together in a bowl and let sit for 5 minutes while you prep some toppings*. Pour base mix into a lightly oiled pan over a medium heat, creating a circular (or heart!) shape as you go. Let the base set and then flip over to brown both sides. Add your toppings and cover – leave cooking over a low heat until the cheese melts. If you have a panini maker or sandwich toaster you could also make a square pizza on here – just don’t leave the lid down too long if you’re using cheese and be sure to apply a little oil to that lid!! *Top with any combination of the following: salsa/pasta sauce/passata, pesto, sliced tomato, red onion, mushrooms, green/red capsicum, tuna, sliced hard boiled egg, sweetcorn, cooked chicken pieces, chopped ham, pineapple, any cheese esp. blue cheese or light mozzarella, and finish with fresh or dried herbs like basil and oregano. Or anything else you like really! Combine all of the ingredients together in a bowl with your hands. Create small patties and arrange on a baking tray. *Alternatively you can cook them in the microwave in just 1 minute!!! (warning: they won’t be super crunchy). Mash the banana with a fork, then beat in the eggs. Add in the linseed and give the mixture a good whisk. Heat a frying pan over a high heat, then turn down low. If you don’t have a non-stick pan simply use a little spray oil to prevent sticking. Pour in the mixture to make two medium sized or three small sized pancakes (per batch). The best thing about this recipe is you can eat them all to yourself for under 300 calories! I hope you enjoyed the article and please feel free to share your own recipes!! !